Poole's Cavern is a 2 million year old, natural limestone cave situated in the beautiful woodland of Buxton Country Park in Derbyshire and has been visited for 5,000 years since Neolithic tribes first used it's chambers as shelter. The cave has been known as 'The First Wonder of the Peak' since the 1600s and recently celebrated its 150th anniversary as an official showcave and tourist attraction. Guided tours of the cavern last approx. 45 minutes and leave every 30 minutes throughout the day. Before you start there is a 15 minute video presentation on the history of Poole's Cavern and the underground environment. There is a constant temperature of 7 degrees in the cavern, so dress warmly. Cameras and flash photography are permitted however the use of video cameras is restricted for safety reasons (please ask for details). The tours are conducted by expert guides who will lead visitors along well-maintained paths to the end of the cavern. You can then return at your own pace, take more photographs or talk informally with your guide. 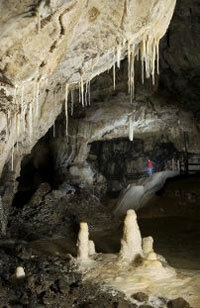 All aspects of the cavern's history, geology and related myths and legends will be covered. Please feel free to ask the guide any questions as the tour progresses.